As part of the 2018 Asia Triennial Manchester, HOME is presenting a rare opportunity to experience some of the early, experimental works of directors, including Tsukamoto Shinya and Sono Sion, who would be at the forefront of a new wave a creativity that surged through Japanese cinema from the late 1980s onwards. In addition, we screen two landmark feature films that remind us of how these directors developed their ideas after these early creative outings. This season is co-presented by Hong Kong International Film Festival, PIA Film Festival and Berlin International Film Festival. 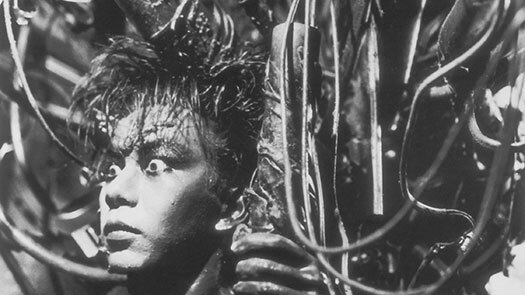 Made on a micro-budget, on 16mm and in black and white, Tetsuo is one of the most influential Japanese films of all time. The story of a man whose flesh slowly merges with metal launched a plethora of inferior cyberpunk copies but none had the energy and sheer filmmaking flare of the original. Tetsuo is an astounding, energetic and original piece of filmmaking that today still has few peers. This screening will be introduced by Sharon Kinsella, author of Money, Schoolgirls, and Rebellion in contemporary Japan and Adult Manga: Culture and Power. Two experimental works including a challenging piece from maverick director Ishii Sogo and early award-winning work from Tetsuo director Tsukamoto Shinya. Influenced by real murders, Cold Fish is the bloody tale of a tropical fish shop owner whose simple life becomes entangled with a murderous rival. The film presents a bleak, violent yet mesmerising image of contemporary Japanese family life and society. This double bill of experimental films showcases Cold Fish director Sion Sono’s early work and the wonderfully oddball Tokyo Cabbageman K from Ogata Akira.